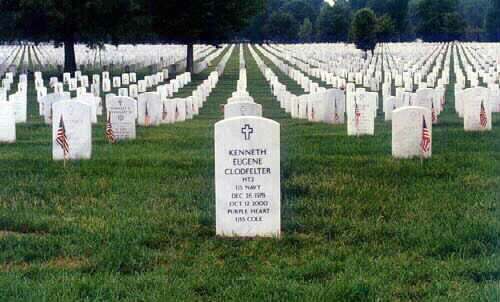 At Arlington National Cemetery, one of the last of the slain sailors brought home from the Cole was buried Tuesday, 31 October 2000. 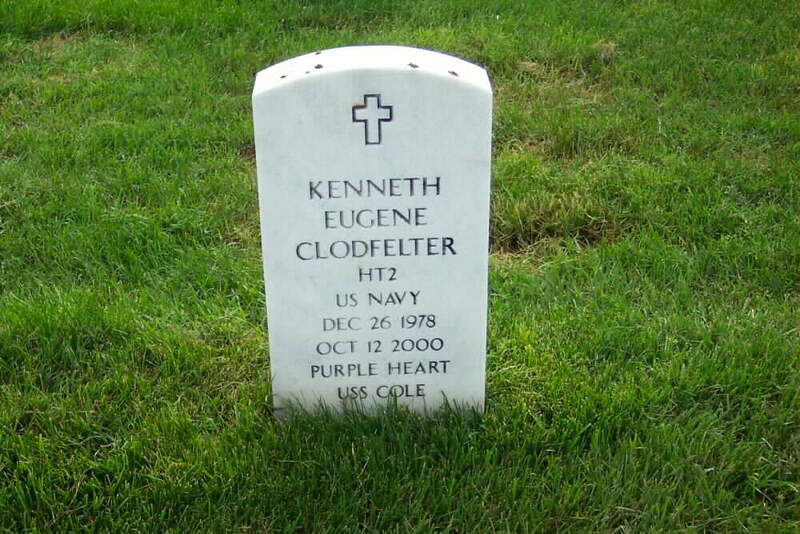 Hull Maintenance Technician 3rd Class Kenneth E. Clodfelter, 21, of Mechanicsville, Virginia, was among the 17 victims of the attack. "Kenneth won't be forgotten, the other 16 won't be forgotten, the Cole won't be forgotten,'' Clodfelter's father, John, said after the funeral. John Clodfelter promised his son he would not let people forget. 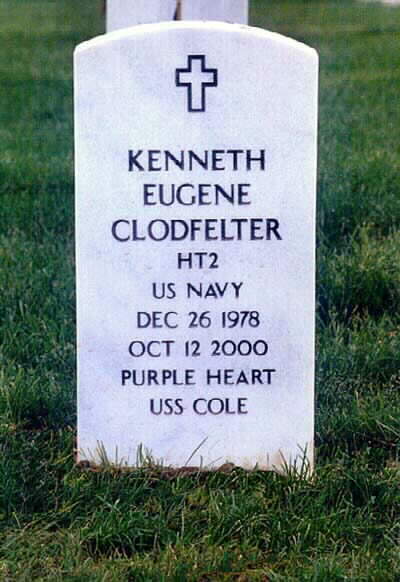 Petty Officer 3rd Class Kenneth Clodfelter, 21, was among 17 sailors killed when the Norfolk-based Navy destroyer USS Cole was bombed by terrorists at a port in Yemen in October. 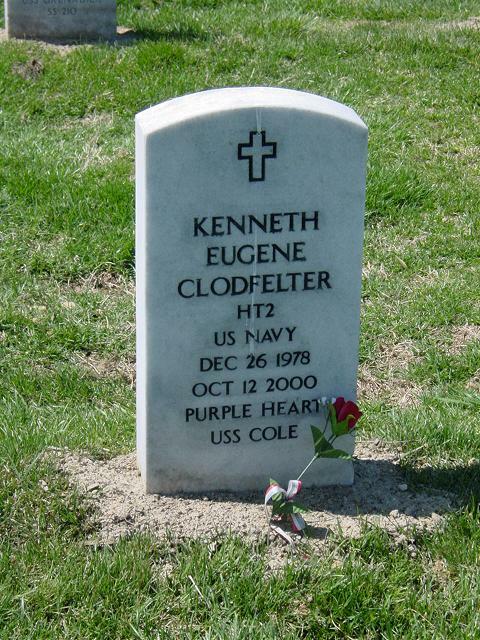 At Kenneth's funeral at Arlington National Cemetery, John Clodfelter put a rose on his son's casket, and on that day made this pledge: "You will never be forgotten, and the USS Cole will never be forgotten." To live up to his vow, Clodfelter, 53, of Mechanicsville, Va., has been leading an effort to get the state of Virginia to issue a commemorative license plate honoring the ship. On Wednesday, with the Navy's assistance, he set up a table in a Pentagon corridor where he collected signatures on a petition in support of the effort. But Pentagon officials tossed him out Wednesday afternoon, saying he did not have a permit. A disappointed Clodfelter didn't go back to the Pentagon Thursday as planned. "I was basically kicked out," Clodfelter said yesterday at Arlington National Cemetery, where he was attending a service for another Cole sailor. "It kind of floored me. The Pentagon, of all places." Pentagon officials acknowledged that they ordered Clodfelter to cease his activities, but they blamed the Navy, which they said did not fill out the proper paperwork. A Navy spokesman admitted that the service failed to deliver the permit application to the proper Pentagon authorities. "It appears to be just a pure error," Cmdr. Greg Smith said. "It was never intentional." Clodfelter said he contacted the secretary of the Navy's office several weeks ago and was told the Navy would arrange for a permit. Initially, all went well Wednesday. A Navy official escorted Clodfelter to the concourse area, where a table was covered with a white cloth. Clodfelter set up a display and gathered three pages of supporters' signatures. About 4 p.m., Clodfelter was approached by a mustachioed man who said that he was from the Pentagon's facility management office. The man told Clodfelter that there was no permit on file for his display. "He said, 'You've got to pack up and leave,' " Clodfelter said. Clodfelter told the man to check with the secretary of the Navy's office, but the man returned a short time later saying the person responsible had gone on vacation. A Pentagon spokesman said officials were doing their job in checking for a permit. "If he didn't have one, then the Navy dropped the ball," Glenn Flood said. "The Navy brought one down [Thursday], which was too late." Clodfelter said he did not blame the Navy, which he said has been very supportive of the Cole families. But he was less complimentary of the Pentagon. "Somebody's not communicating, folks," he said. Clodfelter, a garrulous District native who annually grows out his white beard at Christmas to play Santa Claus, said the Pentagon is the first place to kick him out since he began his effort in March. Clodfelter said he has collected more than 1,000 signatures. He needs 350, but he said he wants to collect several thousand. "I want to make it impossible to turn down," he said. Clodfelter was at Arlington Cemetery yesterday along with several dozen Cole shipmates and family members for the reinterment of one of his son's shipmates, Petty Officer Ronald Scott Owens. Since the Cole was bombed Oct. 12, Clodfelter has attempted to keep family members supporting each other. Several days after the bombing, with his son still listed as missing and presumed dead, Clodfelter and his wife, Gloria, showed up at the Portsmouth Naval Medical Center, trying to cheer up his son's injured shipmates. At the time, Clodfelter refused to consider his son dead. Now, his work for the license plate provides him with some comfort. "I remember President Clinton saying [at a memorial service in Norfolk] it was up to us to give their deaths meaning," he said. "What better way to make sure people don't forget the Cole then to put it on a license plate?" 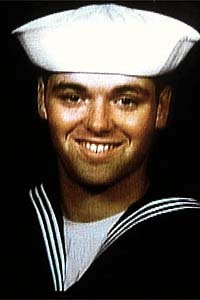 A month after being unceremoniously asked to leave the Pentagon, the father of one of the sailors killed aboard the USS Cole last October will be at the Pentagon today to collect signatures for an effort to have Virginia honor victims of the terrorist attack. 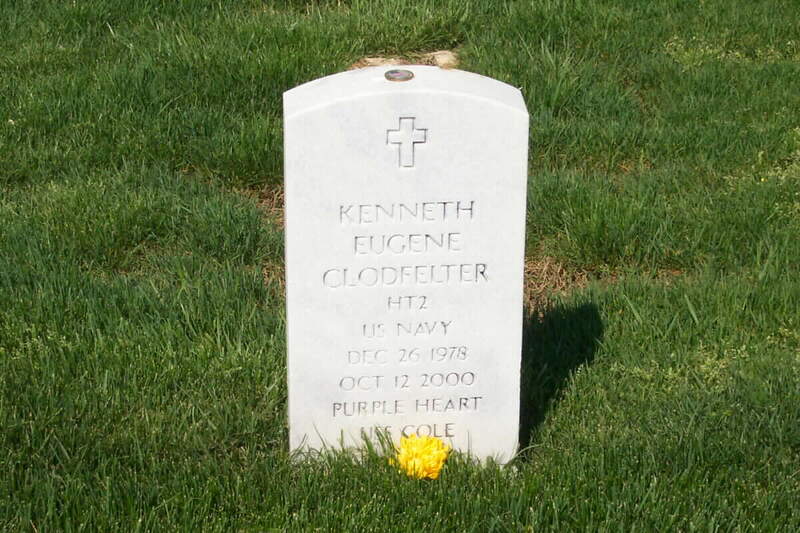 Petty Officer 3rd Class Kenneth Clodfelter, 21, was among 17 sailors killed when terrorists bombed the Norfolk-based Navy destroyer at a port in Yemen on October 12. His father, John Clodfelter, of Mechanicsville, Va., has been leading an effort to have the state issue a commemorative license plate honoring the ship. At his request, Navy officials had arranged for Clodfelter to collect signatures at the Pentagon June 20-21, but they did not file the proper paperwork with building security officials. Late on the first day, a Pentagon official told Clodfelter that he had no permit, was violating federal statutes and would have to leave. Apologetic officials have told Clodfelter that everything will be in order for today's visit. Clodfelter said he expects to be in the Pentagon's concourse area from about 8 a.m. to 5 p.m.
Information about the license plate campaign is available at www.rememberthecole.homestead.com.